One question we often get asked by people planning for their first flock of backyard chickens is this: how do I get friendly birds? How do you train pet chickens to eat from your hand? In most cases, the answer is simple: Handfeeding pet chickens is something you almost never have to specially “train” them to do. Chickens love to eat, and if the food is in your hand, then so be it! Even so, we do have some tips to share that can help if you’re brand new and starting from scratch (pun intended), or in certain other situations where handfeeding chickens may present some obstacles. Situation 1: Your brand new baby chicks all run, terrified, from your hand! This is an issue that often happens with people brand new to chicken keeping, who may not immediately understand how to interact with chickens. For some it’s intuitive, but others may relate more intuitively to other pets. If this is what you’re picturing when you think of pet chickens, it’s easy to achieve! Imagine, for example, a dog person trying to interact with a cat with the same sort of play dogs often appreciate. Dogs enjoy a vigorous scratch behind the ears and some roughhousing, while cats tend to prefer more gentle handling offered on their terms, which does not affront their dignity. To approach a cat the same way you approach a dog is to invite the cat to regard you as a mannerless philistine. Similarly, even though chickens are friendly and can make very good pets—even seeking out your lap and begging for affection— you must first understand how to approach them and interact with them. A person new to chickens may beg for my help taming “wild” chicks that run from their hand whenever it’s placed in the brooder; they are astounded when I have them rushing to my own hand in a matter of 30 minutes. Or just five. Chickens are prey animals, in contrast to dogs and cats, who are predators. Dogs hunt in packs and instinctively cooperate with members of their social group. Cats are solitary hunters. Chickens are certainly bug (and occasional mouse) hunters, but a pack of chickens does not coordinate to hunt down a single prey like dogs do. Chickens are solitary hunters like cats (what bugs I find, I eat! )… but unlike cats, they also organize into flocks, their packs, for safety. 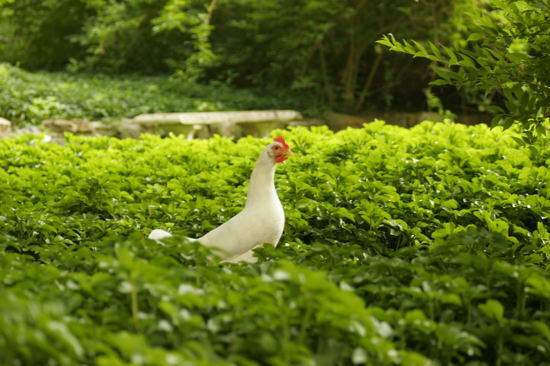 While the hens forage, the roosters keep watch and sound the alarm when a predator is spotted. If there is no rooster, a dominant hen may take that social role. Chickens watch other flock members for clues; when one startles and runs for cover, especially if she is high up on the pecking order, they all may take their clue from her and emulate her behavior. Compounding this issue is that chickens are more or less “programmed” to avoid danger from overhead. This means that when you lean over the brooder and reach your hand in from above, every instinct screams for them to flee. The sky is falling! The solution? Simple enough. Don’t lean over the brooder, and don’t reach directly down into the center of a group of chicks. Sit down and sidle or scoot over to the brooder obliquely. When you reach in, reach in to the side nearest you, rather than toward the chicks directly. Then just leave your feed or treat filled hand in there a while so they can get used to you. When your hand doesn’t turn into a five-headed bird-destroying monster, the most dominant bird in your flock will eventually come over to investigate. The thing is, you only need to charm the dominant bird. The others will all follow their comrade. Once that first bird starts eating, the others will quickly follow, and voila! You are handfeeding chickens. Wash your hands afterward. Repeat this process a few times over the course of a few days, and they will take less and less time to approach your hand. With friendlier breeds, you may have them instantly rushing you in just a matter of a few hours or less. Situation 2: You’re adopting adult birds, and they are stand-offish. “Taming” adult birds can be a challenge even to experienced chicken keepers. What makes it hard is that birds are unquestionably creatures of habit, and where your affection isn’t a part of their habit, it will take a while to establish. Once it is established, though, it is amazing! What makes it easy is that chickens are overwhelmingly food-motivated. They also develop associative memories, so as simple as it seems, to create the habit of friendliness, ground feed them. Don’t immediately worry about handfeeding. In other words, drop something delicious on the ground and let them eat it while you’re there. Be aware that (1.) sudden, vigorous “throwing” motions can scare them (death from above! ); (2.) birds that are more timid may be put more at ease of you are crouching or sitting than if you’re looming over them; and (3.) use feed or treats that come in relatively small tidbits that they’ll have to forage, rather than bigger chunks they can grab and run away with. 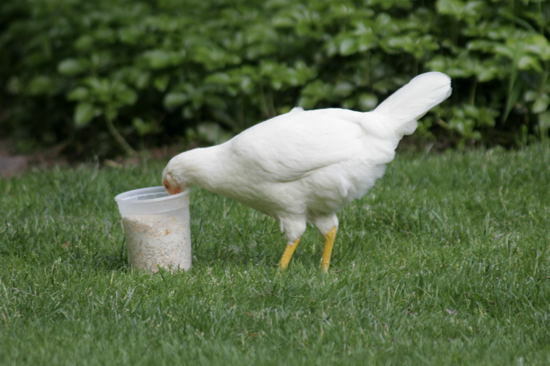 Scratch works well, and our Kelp and Bug Crunchy Trail Mix, designed for chickens is a bit higher in protein (plus it provides micronutrients they need). Another favorite is mealworms. Sunflower seeds or chicken “crack” also work well. Whatever you provide, you should leave just before they’re finished; leave before they do… thus, the treats are only around when YOU are around. They will come to associate you with abundance and deliciousness. Once they come rushing to your feet when you step into their area, you’ll be able to move on to the next step. While you’re crouched or seated, drop some treats to get them interested, but leave most of them in your extended hand. Just as with the baby chicks above, all you need to do is charm the most dominant bird, and you’ll be handfeeding your chickens in no time. 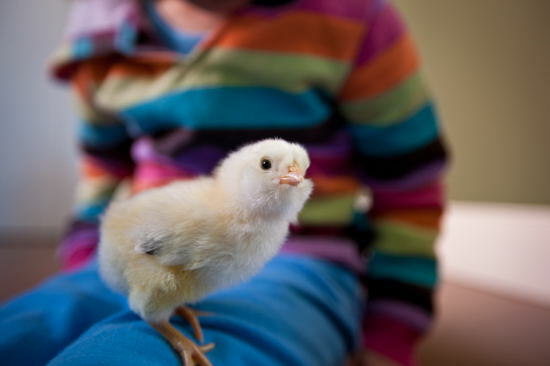 With adults who are set in their ways, it may simply take a little longer than it does with baby chicks. What is that in your hand? Is it for me?!! Situation 3: Your flock is not comprised of friendly breeds. This is the most challenging of the three situations. The truth is that a wild Penedesenca, under most circumstances, will simply not become as friendly as a Speckled Sussex, Silkie, or Orpington. Some breeds tend to startle easily, and may be regarded as “flighty,” but they are not actually unfriendly. They may just require extra attention to avoiding movements that may trigger instincts to flee from danger. But other breeds actively avoid human contact. 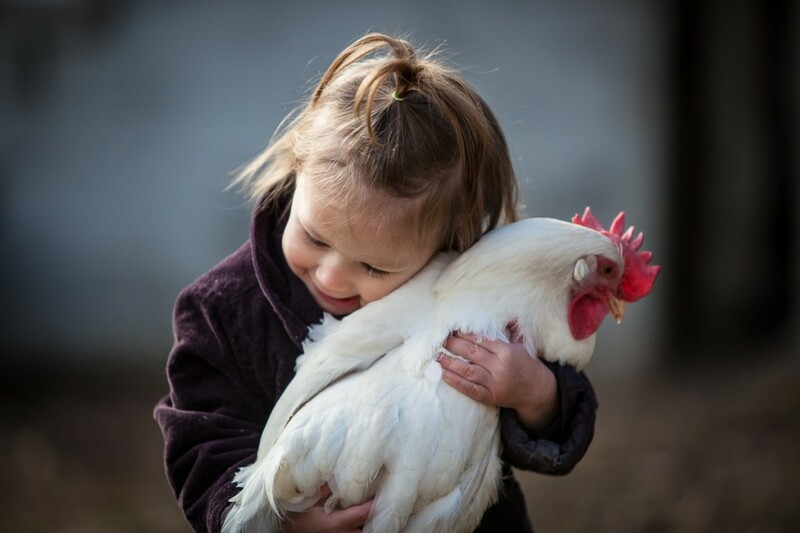 The best solution here is… if you want friendly birds, be sure to choose friendly breeds. (Our book, the My Pet Chicken Handbook, has the most comprehensive guide to choosing the right breed for your situation you will find anywhere.) But if you’re in a situation where you already have some avoidant breeds and want to tame them… you can do so, but it will require patience. Your wild or unfriendly breeds will sometimes not get near enough to you at first to eat any treats you may drop. So, start out by dropping treats or feed… then stepping back to allow them to approach. Again, the dominant bird will usually be the first to take the plunge. Stay where you are, and be very still while they eat. It’s unusual with most breeds, but sometimes working toward handfeeding chickens takes patience! Over the course of a few days (or possibly a few weeks, depending on how flighty they are and how well your body language says “I’m no danger!”), stand closer and closer to the treats as your chickens eat. Eventually you will be able to stand among them. Then proceed as above in situation 2: crouch down, extend your hand, and wait for the dominant bird to approach. This will likely take longer with the wilder breeds than it will for docile ones, but most chickens can be tamed with just a little effort. In the end, you may find your birds alert to every move you make. As soon as you step out of the house, they will all come running to see what you have for them! Hey, there! I’m ready for my treats, get corn cracking! Tell us, what were your experiences in handtaming your birds. When you started, did you find handfeeding chickens difficult, or did you “speak chicken” right away? I’m getting 6 Orpington Bantams ( 1 rooster, 2 hens, and three chicks)tomorrow and I’m in a wheelchair. How can I get the chickens used to me and how can I achieve the above tasks? Being seated in a wheelchair shouldn’t change any of this advice. If you don’t have to access the brooder directly from above (chest or waist level is ideal), things should go smoothly. 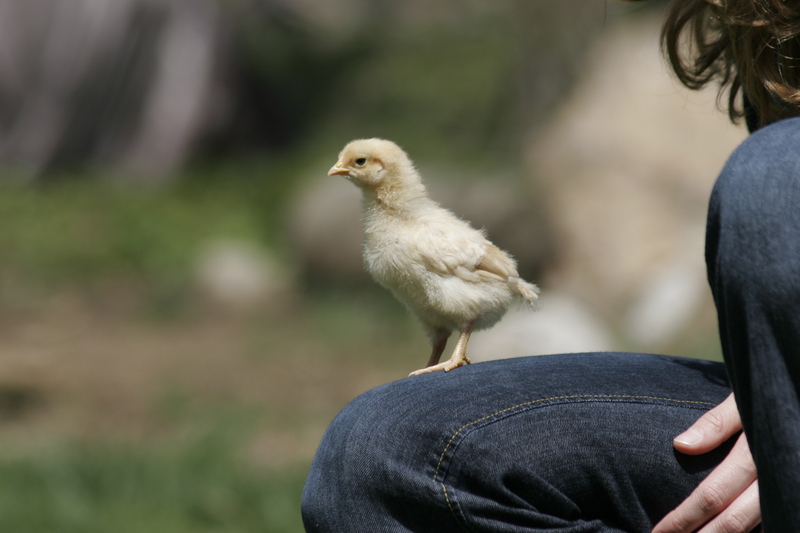 In addition, Orpingtons are generally very friendly birds–some of the best lap chickens! Follow the advice above, and everything will work out. No worries! i have 10 hens, mostly easter egger, but not all are very friendly. some of them come looking for hugs and are good buddies and a couple prefer to be left alone but are never nasty. i just let them be themselves. i raised all but one from hatching day and they are good birds. i have 1 house chicken, she doesn’t know she is a chicken. she comes and goes like a dog, standing outside making noise when she wants in. she sleeps in a kennel in the house and prefers to lay her egg there. she was the only survivor of a hatch and i had no other chicks to put her with, so she bonded to me as her mother. she has been by my side since she was a few days old. she sits in my lap and rests her head on my shoulder, face in my hair for huggies…..the only bad thing is the begging. she figures if we are eating she should be eating too, she walks back and forth over my feet begging for bites. My tamest chickens are my two roosters; my hens are more jumpy. Love reading all about your chickens… maybe one day I will be able to have a few! Found this shop I thought you might get a chuckle out of called ‘Chicks in Hats’! My Rhode islands and Americanas have been a dream…freindly, hardy & great egg layers. Raised them from week old chicks. They have tons of personality. Highly recommend them. We just got our chicks last week. We lost one. They aren’t a week old yet. I started hand feeding them yesterday and they love it. They even jump up on my hand and eat. We have 2 barred plymouth rock, 1 golden comet, 1 Ameraucana, 1 Buff Orpington,and a Welsummer. Does anyone have any advice on these breeds?